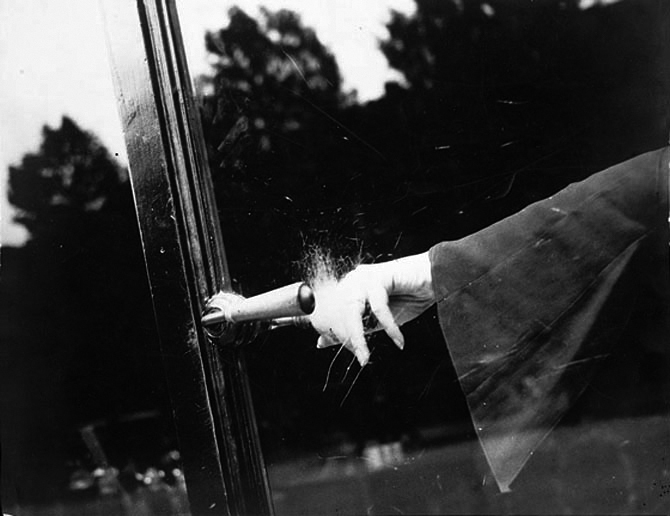 Untitled (Exploding Hand), c. 1930, by Lee Miller. Thirty years ago in provincial France I frequented a quincaillerie whose proprietor was a Monsieur Tardy. In the days when I still did not grasp the precision of French opening hours, I would often miss my pre-midday opportunity with M. Tardy. Once, approaching on the narrow pavement, reaching for the door handle (the classic lever pattern), I was astonished to find the handle was no longer there, and the door was locked for ‘midi’. On a more successful visit M. Tardy showed me how the handle could be taken off and added as a temporary extension to the inside handle for safekeeping. The sight of the absent handle continued to send the perfect Duchampian message until Tardy retired and his fine store became a gift shop. Why humans make images, how we store and retrieve them, and the way they become shared language is a particular preoccupation of artists. It is unsurprising that M. Tardy and the disturbed glass of Lee Miller’s Untitled ( Exploding Hand) photograph cohabit in my mind. Miller’s picture, which I am not looking at as I write (the better to value it as an image), contains a wondrous onomatopoeia. It is collaborative, noisy, abusive, scratchy, itchy, contentious, foggy and palimpsestic. It is offhand, unintended, but brimful of purpose. The acute visitor’s eye and the Yankee technical acumen which Man Ray brought to between-the-wars Paris was the most marvelous bedding for the young and adventurous Lee Miller. The energy in her 1945 (?) * picture owes something to a hybrid of the chemistry lab optics favoured by Man Ray the conjurer, and the persistent vigilance of Eugène Atget who happened to be working down the street when Man Ray set up shop in the city. The visual noise, and the abrasive contrast to the sexual metaphor of grasping a handle, chase each other around in this picture. Knowing, as I now do, the social and political complexities of post war Paris, the extreme positions, the suspicion, the anxieties and the accusations, the shortages mixed with heady relief, the picture grows ever richer. I respect it as the act of an artist, prescient for sure, but not a tidy illustration of the factors in play. Like a conflict site, it helps to ‘know’ that this is where a massacre or a confrontation unfolded, but Miller’s picture with its multiple scratchings from the diamond rings of the well dressed and privileged, remains an etching in my personal file of charged images. Like Duchamp’s phial of Paris air, this picture is scented. This small fogging of the glass, a kind of condensation after the terrible fog of war. * The date of the photograph is in fact 1930. The stored energy in an image is perhaps not so different from the query stored in a question mark. I now discover that the photograph is much more theatrical than I remember it with almost Moholy-Nagy dynamic geometries. Already knowing something of Lee Miller’s personal story I am amused that I had moved the image forwards by fifteen years. Nonetheless, my feelings about its anxiety are just as readily located amidst the tensions of 1930, as they are with those in a later period of uncertainty. Richard Wentworth is a British artist who lives and works in London. Posted on August 31, 2011 December 8, 2016 by vsmallfires	This entry was tagged Lee Miller, Man Ray, Richard Wentworth. Bookmark the permalink.